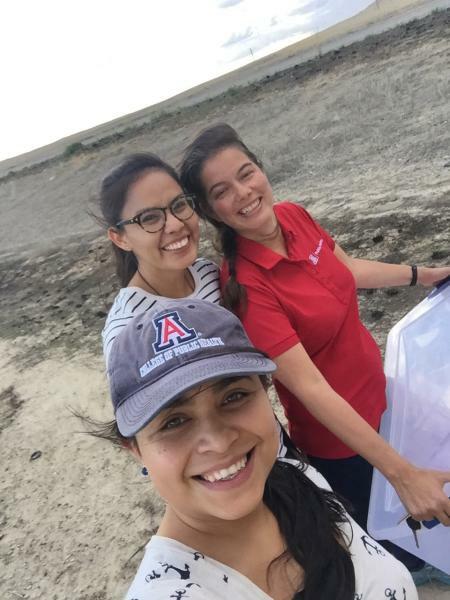 Yoshira Ornelas Van Horne (front), public health doctoral student, is part of a cross-disciplinary team of researchers from the UA who are investigating short-term exposure in Navajo communities after the Gold King Mine toxic spill in 2015. Other team members from the UA College of Public Health include Rachelle Begay, program coordinator for the Center for Indigenous Environmental Health Research (left); and Paloma Beamer, associate professor (right). 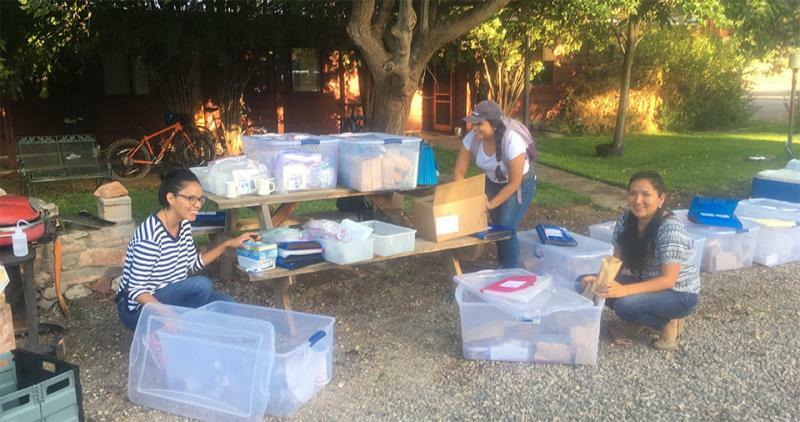 Investigators from the UA College of Public Health organize field sampling materials to test drinking water, soil and dust in Aneth, Utah. From left: Rachelle Begay, Yoshira Ornelas Van Horne and Corinna Sabaque (MPH student). Yoshira Ornelas Van Horne, a doctoral student at the University of Arizona Mel and Enid Zuckerman College of Public Health, led an environmental toxicology training and household exposure sampling campaign with community health representatives (CHRs) from the Navajo Department of Health. Ornelas Van Horne is part of a cross-disciplinary team of researchers from the UA who are investigating short-term exposure in Navajo communities after the Gold King Mine toxic spill in 2015. The important study which is funded by the National Institute of Environmental Health Sciences (NIEHS), is expected to address tribal questions regarding the impact of the environmental disaster on their communities. Leading the investigation are Karletta Chief, PhD., a Navajo hydrologist and assistant professor in the UA Department of Soil, Water and Environmental Sciences and Paloma Beamer, PhD, associate professor of environmental health sciences in the UA Mel and Enid Zuckerman College of Public Health. Both Drs. Chief and Beamer are UA Superfund Research Program (SRP) investigators. The NIEHS grant supports a team of researchers from the UA, Northern Arizona University and Navajo community health representatives. The training was held in Farmington, New Mexico. Topics covered included: human subjects training, collection of urine samples, analysis of blood for lead with a finger-prick sample, environmental monitoring methods, how to administer a detailed questionnaire (diet, exposure activities, and risk perception), and environmental household sampling (drinking water, soil, and dust wipes). After an intense and packed nine-hour training day, the CHRs were presented with certificates in Environmental Health, Lead Care II blood screening, and Community Partner Research Ethics. The next four days were dedicated to the household sampling campaign in Upper Fruitland and Shiprock in New Mexico and Aneth in Utah. The samples will be used to determine differences in exposures between three Navajo communities downstream of the Gold King Mine spill. The investigators will assess changes in sediment, agricultural soil, and river and irrigation water. “The community health representatives we worked with are truly an amazing group of individuals. We would not have been able to reach our sampling goal without them. We learned so much from them in regard to community engagement practices, participant recruitment, and field sampling management,” said Ornelas Van Horne. Ornelas Van Horne and the team of investigators involved in the training and household exposure sampling campaign include: Paloma Beamer (UA Zuckerman College of Public Health); Karletta Chief (UA Department of Soil, Water and Environmental Sciences); Denise Moreno Ramírez (UA SRP); Corinna Sabaque and Heidi Dugi (UA College of Public Health); and Rachelle Begay (UA Center for Indigenous Environmental Health Research). Navajo health expert and collaborator Al Yazzie also attended the training and provided Navajo language translation support regarding how to ask questions and the use of cultural protocols. “Results from this study have the potential to inform risk and intervention strategies in the unfortunate event of future mine spills, particularly in Native American communities,” said Dr. Beamer.